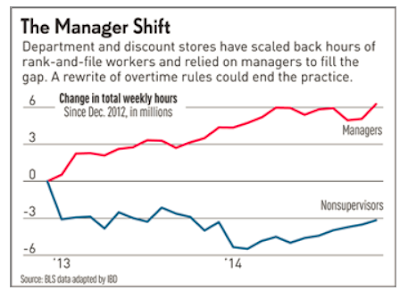 In the last two years, hours worked by managers at discount and department stores are up 86% while hours worked by nonsupervisor employees is down. Why? Supervisors, don't get paid overtime. It's yet another artifact of Obamacare. Please consider The Obama Recovery's Illusory Manager Hiring Binge by Jed Graham. Retailers and other modest-wage employers increasingly are relying on managers, an unusual feature of the Obama economic recovery. Discount and department stores have boosted managers' ranks by 46% in less than two years, Bureau of Labor Statistics data show. And their hours worked have nearly doubled. In reality, this is a classification change more than a hiring binge, and a logical response to the Obamacare employer mandate to provide full-time workers with health insurance or pay a fine. As companies shift some workers below 30 hours per week to avoid the mandate, they also have an incentive to stretch the cost of insuring full-timers over as many hours of work as possible. Nowhere has the shift to managers been more visible than among general merchandise retailers. Since the start of 2013, when the earliest measurement period for the ObamaCare employer mandate got underway (only to be postponed in July of that year), managers at discount and department stores are working 6 million more hours each week, up a hard-to-believe 88% by November 2014. Meanwhile, the ranks of managers have increased by about 92,000, or 46%. Congratulations, you are now a manager, but don't expect any more money. Instead, expect to work 50 hours for the same or slightly more pay. Obama wants to put an end to that by revamping overtime rules for the first time since 2004. Current: Only salaried workers who make less than $455 a week, or $23,660 a year, are guaranteed overtime pay. Department of Labor Proposal: $42,000 a year ($808 a week). EPI Recommendation: The Economic Policy Institute (EPI), wants to increase the limit to a minimum of $51,168 ($984 a week). 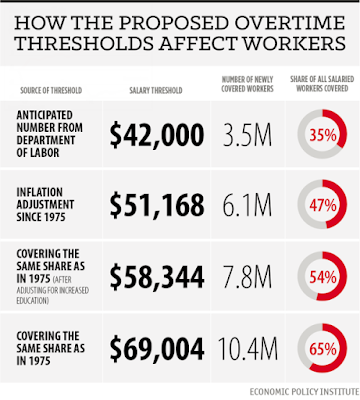 The Department of Labor threshold would expand overtime to 3.5 million managers, while EPI Proposals would affect between 6.1 million and 10.4 million workers. In the past year, four significant proposals have been made. The lowest proposal, for a threshold of $807 per week or $42,000 a year, is rumored to be under consideration at the Department of Labor (DOL). Jared Bernstein and I recommended a simple inflation adjustment of the 1975 threshold: $984 per week or $51,168 a year. In a paper for EPI, Heidi Shierholz suggested that $1,122 per week, or $58,344 a year, was appropriate because it would guarantee that the same share of salaried workers receive overtime protection as were protected in 1975—after adjusting for the different educational composition of the workforce today. The highest figure, proposed by Nick Hanauer, is $1,327 per week, or $69,004 a year. It represents the salary level that would cover the same share of salaried workers as in 1975, but without adjustments for changed demographics. National Retail Federation President Matthew Shay last fall called on industry leaders to "work overtime on overtime. "The proposal is targeted largely at retailers: Overtime could become mandatory for assistant managers making as much as $50,000 if they spend too much time jumping in to work a cash register, stock shelves or help customers," Shay wrote. If Obama does what the EPI asks, expect the ranks of managers to thin dramatically with still more reliance on parttime work and still more double-counting of employees in the establishment job survey.